Managing your social media presence can be a full-time job—and an expensive undertaking. A host of products is available to help, but not every tool is right for everyone. Read on to learn about three apps that can help you post your content across various social networks, and, in some cases, a bit more. Everypost features a neat and clean interface that makes this app easy to use. Everypost’s logo features a megaphone, and its tagline is “amplify yourself,” so I was a little worried about this social media app for Android and iOS when I first started testing it. I feared it would be nothing more than a service for sending as much content as possible to as many social networks as possible. Luckily, it’s more than that. Everypost does help you post content to multiple networks at once, including Facebook, Twitter, Google+, LinkedIn, Pinterest, Tumblr, and Dropbox. The free version limits you to posting to one platform every 24 hours, which is unfortunate, but opting for the $10-per-month Basic Plan removes that restriction. It also adds unlimited and customized scheduling, where the free version lets you schedule up to 10 posts at a time. Everypost doesn’t work with Instagram, because the photo service does not make an API available, Everypost says, but Everypost actually includes some cool Instagram-like features, such as the ability to add filters to the photos you post. 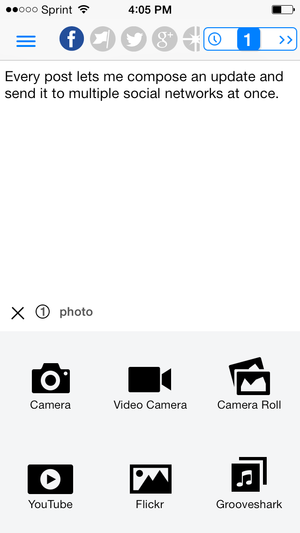 You can’t use Everypost to post multiple photos yet, but the company says it’s adding that feature. The interface is clean and easy to use, and posting text and photos to your favorite sites is a snap. I like how you can select which networks you’d like to use for each post, rather than having your content be sent to all of your networks by default. That extra bit of control goes a long way toward making this service usable. I also like how it automatically shortens Twitter posts for you, yet still allows them to look polished when posted. Everypost is not a tool for browsing your social network feeds; it’s just for posting. And it doesn’t include analytics as some of its competitors do, but the company says those are coming in the soon-to-be-released Web version. That will be a welcome addition to an already worthy social media management tool. Sprout Social displays plenty of information, but does so without looking cluttered or overwhelming. 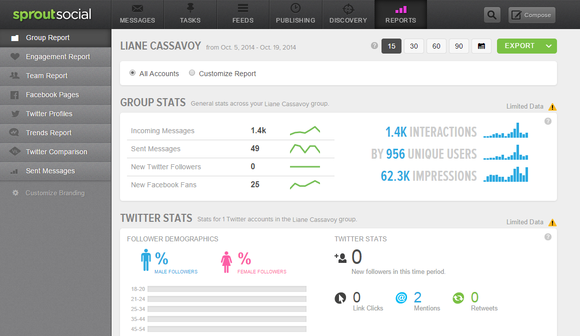 If analytics are a must-have for your social media needs, Sprout Social has you covered. This Web-based service and mobile app (Android and iOS) is a full-featured social media manager, allowing you to post content to and view feeds for Facebook, Google+, LinkedIn, and Twitter, and see full analytics for each of these sites. Unfortunately, Sprout Social is expensive—enough so that it may be prohibitive to many small businesses. On the plus side, Sprout Social is very pretty to look at, and its streamlined interface goes a long way toward making this service very usable, even for social media newbies. At a glance, you can see how your posts are performing, and scheduling future posts across multiple networks is a breeze. The slick dashboard shows you audience demographics that are easy to understand, and using the Reports feature you can dig deeper into the performance of your pages and accounts. I also like how Sprout Social displays your network feeds very cleanly, without using cluttered columns or tabs that some of its competitors, like HootSuite, rely on. Unfortunately, Sprout Social cannot compete with HootSuite in one very important area: price. After a 30-day free trial, the cheapest version of Sprout Social costs $59 per user, per month. HootSuite, meanwhile, offers a free version, with paid plans starting at $10 per month. Buffer’s Web interface is basic, but the service is very usable. One of the biggest questions most social media managers have is “when?”—when should you post content so that it will reach the widest audience. Buffer claims to have the answer. 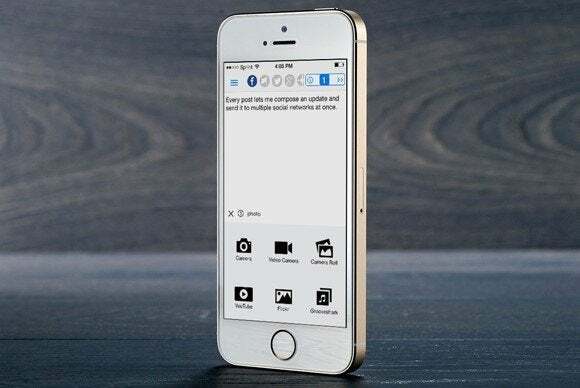 This social media management tool (available on the Web and as a mobile app for Android and iOS) automates the posting of your content based on its analysis of your networks and your content. Buffer connects to Facebook (groups, profiles, and pages), Google+ Pages, LinkedIn (Profiles, Groups, and Company Pages), Twitter, and App.net Profiles. With Buffer’s free account, you can connect to one per social network (so one Facebook Page or Profile, but not both), which means many business users will need to upgrade to the $10-per-month Awesome Plan, which includes support for up to 12 social profiles. Once you’re connected to Buffer, you can enter your content and select which sites and services you’d like to post it to. 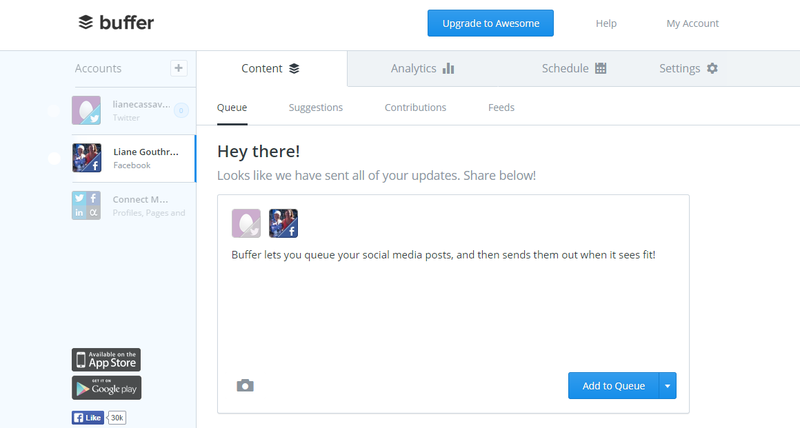 Buffer allows you to queue up 10 posts if you’re using the free version and up to 200 if you’re on the Awesome Plan. The service will post these automatically for you over a given time period, spacing them out as it sees fit. If you’d like to overrule Buffer’s decision, you can schedule a set time for each post. And if you’re questioning Buffer’s decisions, you can use it analytics to see how well your posts have performed. Overall, Buffer proved pretty good at picking when to post items for me, though it wasn’t able to discern time-sensitive items from those that could wait awhile. I like how Buffer takes the guessing game out of social media management.